Till's Import Car Clinic is a family owned and operated auto repair facility serving the southwest Florida area since 1991. 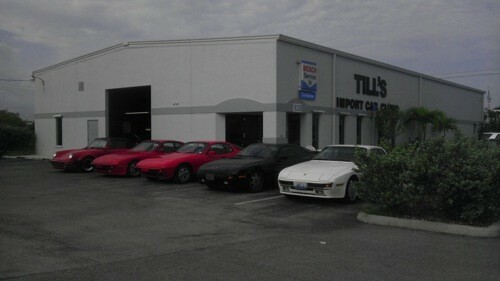 At Till's we specialize in the repair and maintenance of your Porsche and other European import vehicles. We have always prided ourselves on doing quality work for a reasonable price in a timely manner. Please call or stop by for all your vehicles service needs. Dave, just a note in reply to your email. As always I'm extremely happy with the service on my SL500 Mercedes and my 911 Porsche. Your guys are excellent and Smitty always is on top of everything for me when I bring my car to him. I cannot say enough about how satisfied I am to be able to bring the cars I care so much about to you. Dave, My car is running great! I am very happy with the service I received from your company. I will recommend your company to others and will certainly be back in the future to have my car serviced there. Thank you! I chose Tills, for you were referred to me 3-5 years ago and I have always been satisfied with the service and quality care. I have referred others to you. They are also satisfied with Tills. Will I come back? Without question, I go nowhere else! They do an amazing job on my Cayenne. If I ever have an issue, or a question they know the answer right on the spot. They also do a great job getting me in as soon as they can and getting my car back to me in a very short amount of time. I have trusted my 1983 Porsche and my family cars to the Till Clinic for over 20 years. I've always been grateful and happy for their excellent service and excellent results. I have nothing but good things to say about Till's Import Car Clinic. They always give me great service at a fair price. Also, they let me know if a Porsche service is not needed up front. I have never experienced this honesty from any other repair shop. I have been a satisfied Till's Import Car Clinic customer for almost twenty years. During that time, I have learning to depend on Tills staff for excellent diagnosis, careful selection of part sources and concern for my preferences. Tills has performed basic maintenance to a complete overhaul. I prefer Tills over dealerships for the care and maintenance of our cars. Everything was completed as promised! The service people are friendly and helpful. Till's Import Car Clinic always offer suggestions based on what is best for my car, not their bottom line. I trust them. 10 out of 10 for sure!